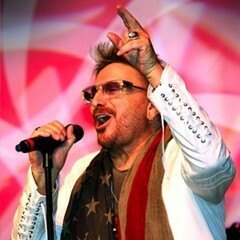 The world was introduced to Chuck and Three Dog Night by the breakthrough-and the band’s first million seller-“ONE.” Driven by Chuck Negron’s solo lead vocals on 4 million selling singles, three #1 records, (one which topped the charts for six weeks, “JOY TO THE WORLD,”) five top 5 hits and seven top 40 hits, Negron put and kept Three Dog Night on the charts for six years! His soaring, soulful, four octave range and unique vocal styling became a part of the American landscape. His gut wrenching performance on the band’s follow up hit to “ONE”, “EASY TO BE HARD” is now a pop classic, as is his beautiful and smooth vocal on “OLD FASHIONED LOVE SONG.” Chuck’s unmistakable voice exclaiming “Jeremiah Was A Bullfrog” on the multi-Grammy nominated and 1971 Record Of The Year, “JOY TO THE WORLD” is today a part of Americana, securing a place for Chuck Negron as one of the great singers in rock and pop.